2. I'm grateful for sleep. 3. I'm grateful for Thanksgiving and some really good, good friends who are coming into town to spend it with us! (We are SO HYPED to see them!) I cannot find a good image of people yacking their heads off to share in this post. However, when these friends come, about all we do is talk, talk, talk, talk, talk. And we never get bored. 4. 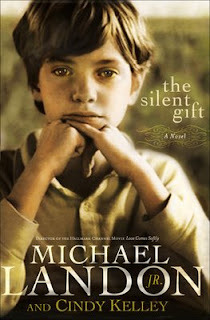 I'm grateful for good reads like The Silent Gift. 5. I'm grateful for my little family who mean the world to me. I love your sleep quotes - especially Miguel de Cervantes's lines. I feel that when I lay down in bed at night - so grateful! That book looks interesting - I'm going to check it out. We are having supper with good friends this evening - and we're just like you and your friends - we chat and laugh non-stop all evening long. May you and your little family enjoy God's goodness this weekend. Amen to #1! And I especially like Shakespeare's quote about sleep. Getting together with good friends is a wonderful blessing. We're overdue for time with ours. We must be kindred spirits -- I love sleep, too! Thanks for sharing this: "I'm grateful that we frequently do see the goodness of God in the land of the living. (Otherwise I would despair, as the verse says.)" I needed to hear that today. Love the Don Quixote quote. I love a good read too. Having access to books is such a blessing. Thanks for the giveaway. I'm definitely entering. This is kind of weird - this morning it has been on my mind that we should never let the 'badness' of men keep us from seeing the 'goodness' of God. So I was thrilled to see you mention seeing God's goodness. I have been seeing in an incredible way this week how God knows my needs, and how He provides for them everyday. How AMAZING is that? We serve a Good and Perfect God. Wednesday night I went to sleep feeling so discouraged, and Thursday morning I received an encouraging email from a friend that writes to me very rarely. That was only the first of 4 or 5 encouraging things that happened yesterday, and I know it was God using others to lift my spirits. The quote from "Macbeth" has always been one of my favorites because it just rings so true. Enjoy your upcoming Thanksgiving holidays. It sounds like you have a real blessed treat in store for you. I am grateful for sleep as well. Especially when I am able to sleep long and hard. . . it feels so good! I do love to scrapbook but I think I must simplify this before it overtakes me. I will keep you posted on the blog as I explore the digital world. Blessings. That #1 is one of my favorite verses, and esp in the NASB as you've quoted. Your Thanksgiving sounds like it's going to be GREAT!